It’s sad that ATI or AMD still hasn’t fixed the pointer corruption issue with their video cards. It’s still there even in my 7850, and it was there years ago. I don’t understand why they can’t just fix it? They can make the fastest video cards on the market but can’t fix a tiny cursor issue?! There is a quick and dirty fix for it though, add pointer trails to your cursor. Yes I know they’re annoying so set them to the shortest and they really can’t be seen. 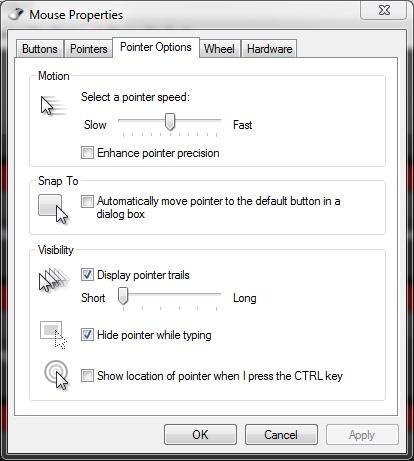 Ever since I turned them on I’ve had no more corruption with my cursor. "Diablotek has sent us over another case for review, this one is called the Cyclops and it’s part of their gamer series. This would be considered a budget case as it sells for around $70 but just because it’s budget doesn’t mean it’s not full of some great features like five pre-installed fans for cooling. Once I got started installing my system in the Cyclops I did run across some rather small issues or annoyances so it’s not a perfect case but for a budget case it’s not bad. I especially like the looks of it, it looks like a gamer case. So read one to learn more… "